Whether Damien Hirst is a great artist, or simply a great self-promoter, is a question that has always divided us art lovers. Certainly he does nothing quietly. Other conceptual artists might try their hand at painting, or dabble with new media. Hirst, however, makes a Return to Painting, in a blaze of publicity and in a gallery - the Wallace Collection - laden with old Masters and other past treasures. 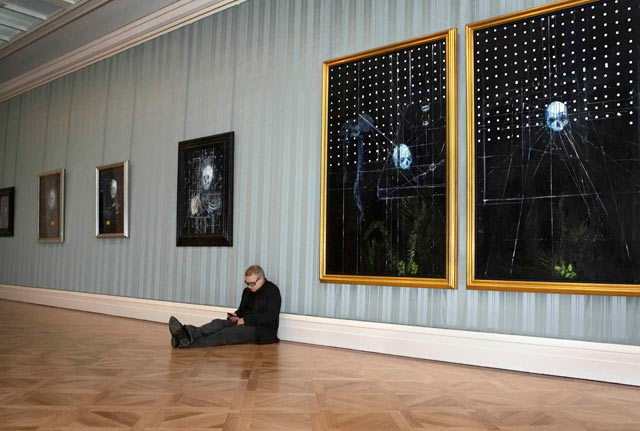 So, our question was, do the paintings of his return justify the hype, or measure up to the works of the famous figures - Rembrandt and Francis Bacon among them - that Hirst has been name-checking in interviews? Not quite, is the answer. Almost all the paintings in ‘No Love Lost’ are of palely glowing skulls, paired with a strange array of other objects, fading into deep blue-black backgrounds. So despite the novelty of the medium, it's the same old themes - death, decay, the contrast between aliveness and nothingness - that have always obsessed Hirst. The best are the simplest: a single skull that melts into the thick brushstrokes of the blackness behind, even its eye sockets seeming to evaporate; a vase of white roses surrounded by crisscrossing lines and an explosion of pale butterflies. Both are eerily moving, haunting, even. Most of the rest, sadly, we found over-elaborate. As the skulls get covered in more and more lines, surrounded by white dots, or paired with ashtrays, lemons and even iguanas, they get messier and more confused. Either Hirst's technical skills don't match his conceptual ability (though some would dispute that he has even that), or he just doesn't know what he's doing with the paint. What 'No Love Lost' does, indirectly, is remind us of the marvels of the Wallace Collection. Hirst's last exhibition at auctioneers Sotheby's, where every mass-produced dot painting already bore a price tag, was so blatantly consumerist as to be almost nauseating. The often neglected Collection, just the other side of Bond Street, contains hundreds of genuine masterpieces - and it's free. Well worth a visit, whether or not Hirst's new work takes hold of you. No Love Lost: Blue Paintings by Damien Hirst runs until January 24th 2010. Entry is free.